Canterbury House Publishing, 9780982905425, 213pp. 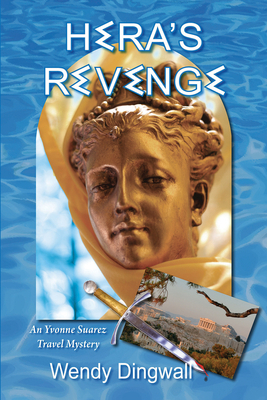 Hera's Revenge is the first in the Yvonne Suarez travel mysteries. From metropolitan Fort Lauderdale, Florida where the Pinkerton Travel agency is located across from the famous Galt Ocean Mile, to exotic destinations around the world, this series is sure to carry readers along on an exciting adventure. In Hera's Revenge, when an airport employee turns up dead in baggage claim upon their arrival in Athens, the Pinkerton Travel Group gets off to a rocky start. How far will travel agent, Yvonne Suarez go to keep her clients safe, and her tour on track? David Ludlow needs a vacation from his stressful job, and this itinerary to the land of mythology, Greek philosophers and early democrats is just the ticket to a leisurely escape, until grumpy passengers, missing museum art, and deathly accidents plague their journey.